The IoT will play an increasing part in the digital transformation of insurance and reinsurance. Insurtechs and insurers have many uses for UAVs, or drones. When it comes to digital transformation in the financial industry, insurance companies have been lagging far behind in some ways. Encumbered with many of the problems besetting the banks, such as legacy systems, statutory and governance requirements and business models that are up to 300 years old, they see transforming into a digital presence as an uphill task. Yet in some ways, insurers have leapfrogged new technological hurdles, especially when assimilating the Internet of Things by using devices both to assess claims and to reduce risks. Insurers such as State Farm have been using telematics in weather risk mitigation for years and are expanding the use of sensors into automobile and home insurance. For motor insurance, the Canadian branch of State Farm is using a combination of a mobile app together with the sensors in the phone to record the driving habits of the insured customer. Good driving results in reduced premiums, so everyone wins. Also, home insurers are given a free leak detector when they sign up for the Alert program. There are many similar IoT initiatives that insurers are introducing in P&C (Property and Casualty) insurance, but the real ace in the pack is the use of unmanned aerial vehicles (UAVs), or drones. Images of the property to be insured can be obtained prior to providing cover. Claims assessors’ safety is improved, and they can complete their work quicker when using a drone to inspect a building. In case of a disaster or catastrophe, a drone can provide feedback on the extent of the damage long before the site is safe or accessible. Turnaround time on claims can be reduced. There is another benefit attached to drone technology that is unique to insurers, because they are in the business of risk: insuring drones opens a new line of business. Although the application of drones to risk situations by insurers is very recent, adoption of these devices and the data they provide is taking off rapidly, and within a few years could well become the norm for risk mitigation and assessment. While all this sounds very positive, there is one main stumbling block: the uncertainty around regulating drone flight, especially in the US where the FAA has been dragging its heels for some time. This has even led to some companies hunting around for countries with more relaxed laws on drone usage, such as AIG, which started a UAV test center in New Zealand for its first foray into using drones. While some insurers in the US have received the permission to use drones by the FAA, there are still some limitations that need to be addressed. In their report on drones, Goldman Sachs provided the following illustration of this dilemma. The line-of-sight is a serious limitation for some cases, for instance, where a drone could be used for inspecting a pipeline or a transmission line that is hundreds of miles long. Similarly, if a UAV is being used to assess fire or storm damage, the line of sight is limited by poor visibility. While some finality on the regulations would be good both for using drones and for insuring them, insurers and insurtechs are not letting the grass grow under their feet. When one thinks of insurtechs, drone companies do not spring to mind. Yet the companies below have all been partnered or invested in by insurers and reinsurers, which surely qualifies them as insurtechs. Airware – provides hardware, software and services in drone management, as well as cloud services for data storage and a drone platform. State Farm has invested in them and uses their drones for property assessments. Betterview – a drone service provider that sits firmly in the insurtech space, Betterview's services are used by Maiden Re and Munich Re. Apart from drone services, Betterview also offers cloud storage and analytics. Converge – this company has developed an app that makes drone flight easy for people with no drone piloting skills. They have done work in loss adjustment with a major insurance company. Kespry – Farmers Insurance use Kespry's services for roof inspections and other claims activities. They offer cloud services for data storage and analysis as well as drone inspections. Precisionhawk – the first drone manufacturer and service provider to be exempted from the line-of-sight ruling by the FAA and a participant in the FAA Pathfinder Initiative together with CNNand BNSF Railway. Precisionhawk offers drone mapping software and is developing a drone safety platform. Munich Re has invested in and uses the services of this company. This is not an exhaustive list, and it can be expected that there will be further new entrants. It also does not take into account other service providers, such as specialists in data analytics and big data who can assist an insurance company in getting the best value out of the volumes of data fed back by the drones. There are also insurers and reinsurers who are taking an active interest and using their specialist knowledge. AIG specializes in aviation insurance, with many of their employees in this line of business being qualified pilots, and has used this in-house expertise to set up their own fleet of drones. They are also one of the first insurers to offer comprehensive drone insurance, based on their collective knowledge. 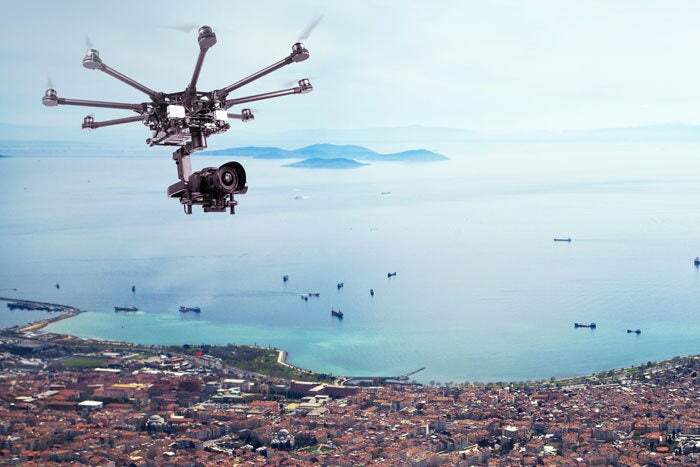 Willis Re, the reinsurance broking arm of Willis Towers Watson, has partnered with Measure, another drone company to offer drone rental services to insurers and reinsurers. They have also entered the policy market for drones. An early reinsurance example is the Typhoon Goni catastrophe, where AIG used a drone to ease the claims backlog. One of their clients was a factory owner whose roof was leaking. It was too dangerous to send an inspector up to find the leak, so a drone was used instead. In personal insurance, one of the riskiest and commonest activities that a claims assessor has to engage in is roof inspections. This is a hazardous and time-consuming process. It can result in injury to the inspector and take hours navigating around the roof to get a full inspection done. Using a drone radically reduces the time spent gathering the information, and the inspector does not even have to be on site, as a drone pilot can be sent out instead. Kespry notes that an adjuster can triple the number of sites visited from 2 to 3 a day to up to 9 claims. Insurance adjuster Jay explains some of the hazards and challenges of roof inspection in the video below, as well as why drones provide a superior alternative to human building inspections. Improved efficiency would seem to threaten jobs in the insurance industry, but this is probably not the case since the jobs will change. The Association for Unmanned Vehicle Systems International (AUVSI) predicts that over 100,000 new jobs will be created in the US due to the growth of the drone industry by 2025. These are direct manufacturing jobs, associated work, such as jobs as pilots, and air traffic control. At the same time, data and cloud services have not been factored in. While it is true that AI will be applied to the data to make it meaningful, there will still be a need for humans to interpret this information and make decisions based on it. Risk management will become increasingly predictive rather than reactive. Drones can be used to quantify risk and design mitigations, something that is especially needed by reinsurers in these times of climate change and the extreme weather it generates. Preventative maintenance will still be carried out by field workers, but they will be spared the risks of working at height and exposure to toxic gases and radiation by using a drone to perform the inspection. Fatalities and work-related injuries will drop off drastically. The claims experience will improve for all the concerned. The customer’s claim will be resolved much more speedily, the adjuster will be able to process far more claims as well as have the benefit of data analytics based on related previous claims. The insurer will achieve major cost savings through the improved efficiency, which will generate the ROI for investing in drones. The proliferation of drones means that more insurance cover will be required. Apart from covering the UAV, there are additional insurances like public liability that are necessary, both in the corporate and consumer space. Drones are only one part of the connected world and the Internet of Things. The insurance industry, so set in its ways for more than a century, will transform radically through its connection with its customers and their devices. By the end of the next decade, the industry as it is today will be unrecognizable, replaced with new business models and new products and services. Darya Shmat is a business development representative at Iflexion with 10+ years of experience in the banking industry.